Exhibit visitors have their picture taken in front of the entry sign, a silent video feedback loop of the in pulse logo. 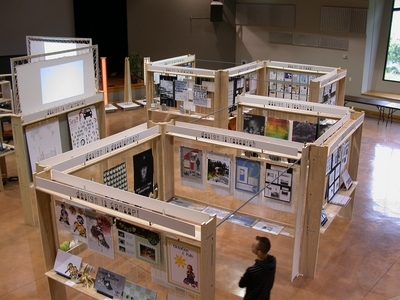 The structures snake around the main central digital media "room", above which four screens project the work of the motion graphics students. A very stylish Frankie visits the show. See-through panels holding the artwork clipped to vertical braids create open yet intimate "cubicle" spaces. 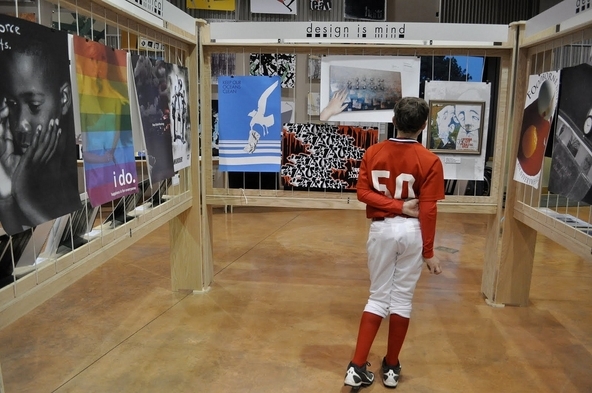 One enjoys the artwork as well as observing other people through the transparent walls. 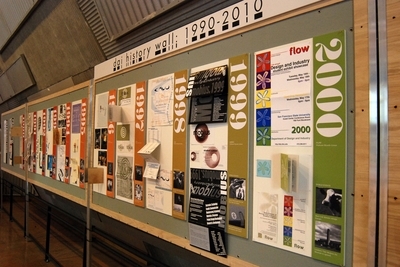 A wall encompassing the last 20 years of exhibits of Design and Industry students. Original artifacts and vintage photographs. 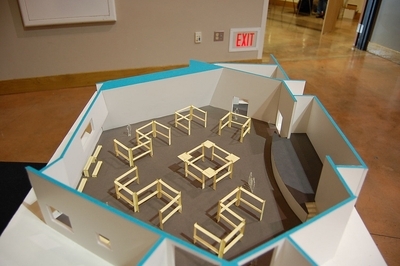 A model of the 5,000 sq ft exhibit greeted the visitors as they entered the hall. 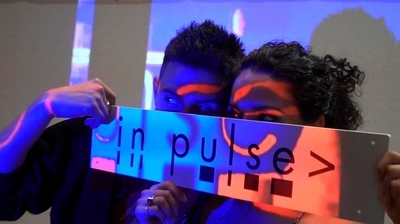 In Pulse: The Rhythms of Design. 21st Annual Design and Industry Student Exhibition. The 5,000 sq ft exhibit, showcasing more than 250 works from the students of the Design and Industry department at San Francisco State University, had its opening reception on Wednesday, May 12, from 6 to 9pm. The show was only open from Tuesday, May 11 to Friday, May 14, at Jack Adams Hall in the Cesar Chavez Student Center in the SF State main campus. If you missed the show, below are some links to pictures and videos. Thank you to the students of my 524 Exhibit Design class, the DAI department, and everyone else that made the show possible. Hope to see you next year.